I became a BIG Brandon Sanderson fan this past year… and luckily for me, after I binge-read the Mistborn series, there were still plenty of books for me to catch up on! Naturally, being a mostly YA reader and with the release of the second book in Sanderson’s Reckoners series FIREFIGHT, STEELHEART was high on my radar! When Audible contacted me to see if I was interested in the audio, it was the final gentle push to start this series immediately — and I was more than happy to! STEELHEART was excellent. So far from Sanderson I’ve read high fantasy, fantasy meets steampunk meets Western, and mystery meets psychological so I was already fairly convinced that Sanderson can dabble in anything he wants to and I will straight-up love it. From the synopsis I gathered that STEELHEART was more superheroes meets dystopian and that was fairly spot on. It’s definitely more of a superhero/science fiction feel in somewhat dystopian society and I really just gobbled it up!. The characters, as always, are excellent. Each character has SUCH personality and they really just leap off the page (or in my case, make themselves individual while I listen to the audiobook). David is an excellent main character and he’s just so relatable. He’s got it out for Steelheart ever since a life-altering event when he was a kid and ten years later, all of his well-laid plans are finally starting to come together when he comes across the Reckoners — a group of individuals who hunt down Epics. I loved David so much because HE’S not the superhero. He’s an average kid who had some stuff happen in his life and he does what he has to in order to get by. He’s clever, crafty, detail-oriented, and also your average guy/teenager who wants to be the badass who gets to hunt Epics and do some cool movie-type stunts (but in real life). He works hard for what he wants but he’s also very passionate too (which also tends to get in his way). The other characters are great too. It’s another fantastic ensemble and a really great range of people and personalities. They don’t always all get along perfectly, but they come together to form a really cohesive team. I LOVED the banter between Megan and David (bring on the banter!!!!) and he really took it so well. David always cracked me up and even when he was having a hard time with things, he was a really easy-going person and took everything in stride. The overall concept was really interesting as well! I love how the Epics were superhero-types but… they weren’t the good guys! And the limitations and structure of their abilities was so well-crafted and cleverly explored as the plot progressed. I really liked how STEELHEART was a sort of mash-up of so many elements that just clicked. A bit dystopian from the current state of the US after the Epic takeover and tyranny, a bit fantasy from the Epic powers BUT more science-fiction based on how they came about (that we know of so far) and of course overall action and adventure with a little bit of romance. STEELHEART was so excellent. I laughed, I gasped, I even ugly cried, you guys. Who expected that? 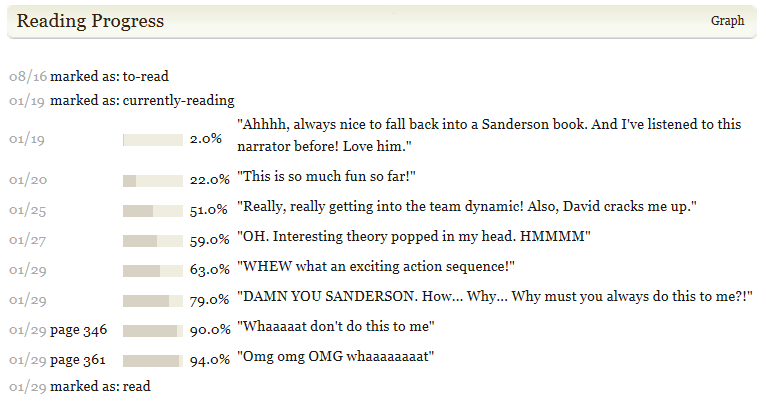 (But it IS Sanderson and sometimes he just hits you where you least expect it.) I loved the feel, I loved the plot, I loved the characters and of course, I will be coming back for more! A big thank you to Audible for approaching me to try the audio version of STEELHEART! I actually didn’t even check out who the narrator was before I started (oops, that’s not always a good move) but I was in good hands with MacLeod Andrews! I was so excited to find out he was the narrator for STEELHEART because I had previously listened to Lies Beneath by Anne Greenwood Brown and just loved his narration on that. His voicing of the characters was fantastic — each very unique and always so genuine. I fell right into the book and could really just picture in my head almost like I was watching a movie. If you’re looking for a good audiobook, this is one I highly recommend! David // Character Obsessions: Steelheart, the Reckoners, revenge, looking cooool. David was the best. He was kind, funny, determined, smart and he had just SUCH a big personality! He was hilarious and definitely the kind of guy that I always root for! Just loved him. Megan // Character Obsessions: Teamwork, plans, action. Megan was my other favorite — and naturally, since she was pretty much the other main character. She dished everything back to David and he handled with ease… but I also wanted to break that steely exterior (no pun indended) SO BADLY. By the end of this book, I was totally shipping them. HARD. Kept Me Hooked On: Superheroes! Well, they were called Epics, but the concept is more or less the same. I don’t think I’ve read a superhero book before!!! Left Me Wanting More: Answers! Not like there weren’t enough, but I love how Sanderson sets up SERIES with series-long questions and discoveries… too bad I’m impatient and want them all nowwwww. I am even more so a Sanderson fan now but if you haven’t read his adult books yet, you should start off with this YA series! It was SO much fun and incredibly interesting. It really had it all for me! This entry was posted in Books, Dystopian, Sci-Fi, YA and tagged Books, Brandon Sanderson, Dystopian, Review, Sci-Fi, Science Fiction, Steelheart, Superheroes, The Reckoners, YA, Young Adult on March 6, 2015 by Brittany. I love this series so so much, it was the book that got me hooked on Brandon Sanderson. David is without a doubt one of my favorite MCs. He’s complex and hilarious! I love how bad he is at metaphors. I also really love the world, superpowers is my favorite magical system and this one is so cool. And the twists in this book are out of control. I can’t wait to see what you think of Firefight! Oh, and I also listened to the audio of this one and the narrator did such a fantastic job! It’s a crazy cast of characters and that definitely came across in the narration. He captured the humor, mystery, and action of the book so perfectly! Great… now I want to reread! Ahhh! I don’t even know where to begin with Sanderson novels because Steelheart sounds just as good as Firefight! Glad to hear you’re enjoying all of the Sanderson stuff you’ve been reading so far though; makes me really excited to see what I think of his stuff! Wow this book seems amazing and right up my alley. I mean superheroes! How cool! I have only heard amazing things about Brandon Sanderson, and this review made me want read something from him even more. The audiobook seems like it would be a great listen too! Whoops… read these reviews in reverse! Anyway, I too liked that David was a normal guy and his best asset was his research and powers of deduction! Nerdy boys for the win! Also – his terrible metaphors are the best quirky personality trait! And I’ll take evil superheroes any day, or I guess I should say supervillains!